With the Windows Phone mobile operating system gaining wide spread popularity, Samsung decided it was finally time to make their own device. Running on Windows Phone 8, this mobile is set to go up against the other flagship phones for the OS, including the Nokia 920 and the HTC Windows Phone 8x. Packed with features, the Ativ S is already expected to compete against iPhone 5, it’s cousin the Galaxy S3, and other heavy-hitters in the same price bracket. 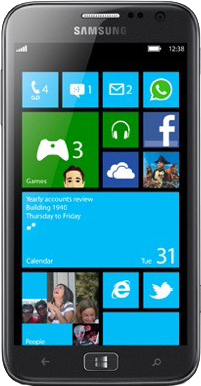 With it’s Dual-core 1.5 GHz processor using 1GB of RAM, the Ativ S will have plenty of power to present Windows Phone 8 at it’s best. Coming in both 16 and 32GB models, with the option to expand up to an additional 32GB with a MicroSD card, a lack of storage will not be an issue, no matter how large your music or movie library might be. Thanks to all that extra space, you can expect multi-tasking, gaming, streaming, and downloading to be smooth and lightening fast. The Ativ S and Galaxy S3 not only share similar looks, they also have identical displays: Super AMOLED measuring in at 4.8 inches. With a generous screen, vibrant colors and rich saturation, the viewing experience on the Ativ S is the best the market has to offer. With it’s Adreno 225 GPU, gaming graphics are seamless. Users will also enjoy a Stereo FM radio, NFC chip, GPS, and two cameras: a front-facing 8MP camera with LED flash and 1080p high definition video, and a 1.9MP front-facing camera, perfect for video calls and chat. Although Android once held the trophy for most customizable operating system, Windows Phone has definitely replaced them at the top. Although surprising consumers and critics alike, the Live Tile system for home screen apps and widget organization is unlike any other, which has helped it’s appeal spread. The way the tiles can be organized and divided, and how much information they can display, can not be matched even by Android. Displaying unread emails, the latest status updates and upcoming events at a glance makes the interface informative and easy to use. With so much success following other Samsung devices, including the Galaxy S3, the Ativ S has a lot to live up to. Although the first Windows Phone device for the company, it is definitely living up to the high expectations. With their best selling Android phones, and now that they are including Windows fans as apart of their consumer audience, Samsung is set to overtake the smartphone and tablet market, despite Apple’s many attempts to thwart their efforts in court.